In the distant future I see open fields for far more important researches. Psychology will be based on a new foundation, that of the necessary acquirement of each mental power and capacity by gradation. 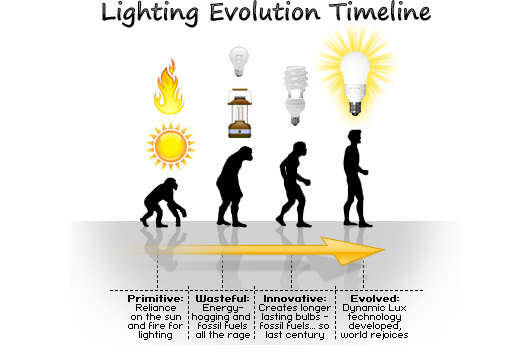 Light will be thrown on the origin of man and his history. – some dude. We are a dreadfully narcissistic lot. 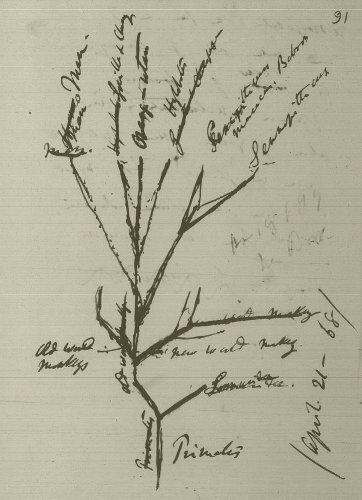 Perhaps nothing in the Origin has inspired more reflection or revulsion than Darwin’s passing reference to the promise that his ideas had to illuminate the origins of our own species. 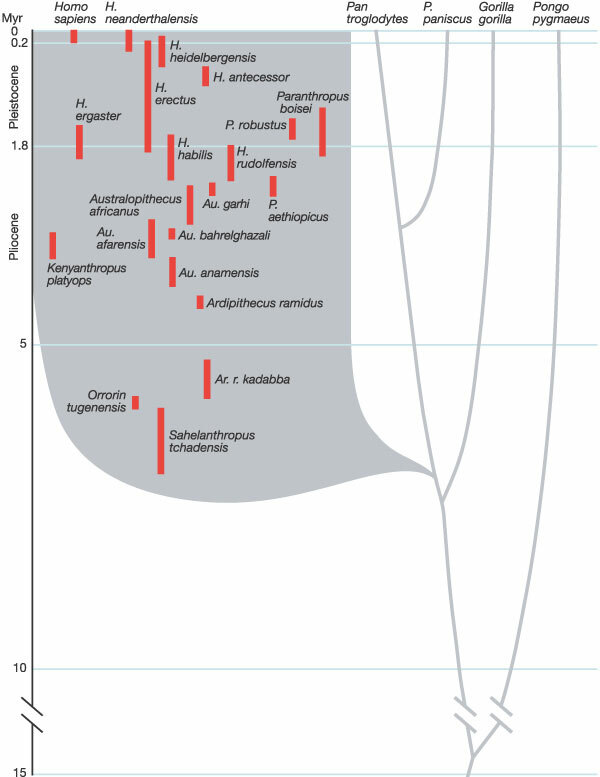 Creationists might bloviate about bacterial flagella or blood-clotting proteins, but most are surprisingly willing to concede the fairly obvious genetic relations between, say, camels and llamas separated by two oceans and millions (or in the case of YECers maybe six thousand) years. They even have a wonky pseudoscience, baraminology, that more or less admits that yes sister taxa have a common origin…up to a point. But when it comes to one particular species, they invariably draw the line. Of course as Darwin rightly anticipated, much has been learned in the last century and a half about the origins of our own species–it’s not my intention to review the history of these discoveries here, but I highly recommend Brian Switek’s comprehensive historical analysis as a great place to start. But while much light has been thrown, perhaps an equal measure of ink has been shed in an attempt to visualize the evolutionary history of Homo sapiens. It’s mostly been uphill from there, but often up the wrong the hill. Like a teenager flexing in the mirror, then agonizing for an hour over a newly discovered blackhead. 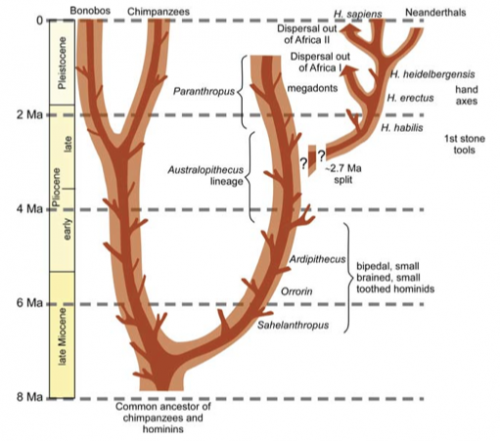 So, here then, gleaned from google are various other diagrams each ostensibly depicting more or less the same events: 5 million years of ape evolution in Africa plus some things that came after. Feel free to leave your Tuftian critiques in the comments, bonus points for dropping fashionable jargon like “chart junk” “data-ink-ratio” &c.
“Um…what are you working on?” my lab mate asked. A few hours earlier she had shown me a truly rank skull that she had just dissected from a frozen chimaerid. National Geographic is reporting on the Choroapithecus abyssinicus, with this nails-on-the chalkboard headline: “New Fossil Ape May Shatter Human Evolution Theory.” Guys. Come on? The shattering find: a 10 million year-old african ape that may push the human-gorilla split back well before what genetic studies have predicted, appearing in this week’s Nature (abstract here). Two weeks ago we were “questioning” and now we’re “shattering” human evolution??? 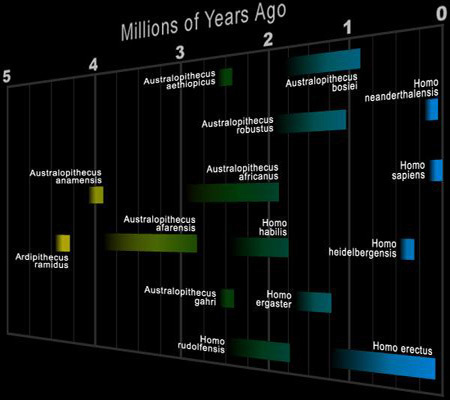 By finding ancient fossils that shed new light on the radiation and ramification of our clade? 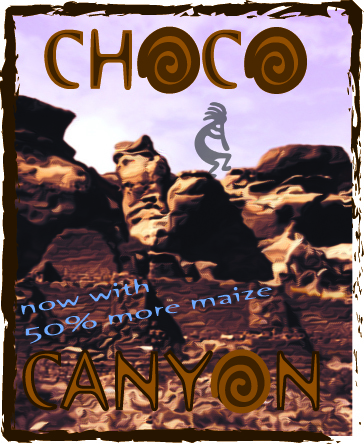 It’s enough to make you want to cover your body in hoodia diet patches and wait for the rapture. Pharyngula and Afarensis have already taken this horribly sloppy headline writing to task, while John Hawks strikes back with an equally ambitious, but not blatantly false, headline: Did Gen Suwa just save paleoanthropology? Now, if you’ll excuse me, I have a letter to write. Things you don’t want to meet down in the sewer. Psittacosaurus goes to the hairdresser and comes back with extensions. Like this needs another link. You can’t write yourself out of prehistory Brian. The boneyard heads over to When Pigs Fly Returns in two weeks. See you there. 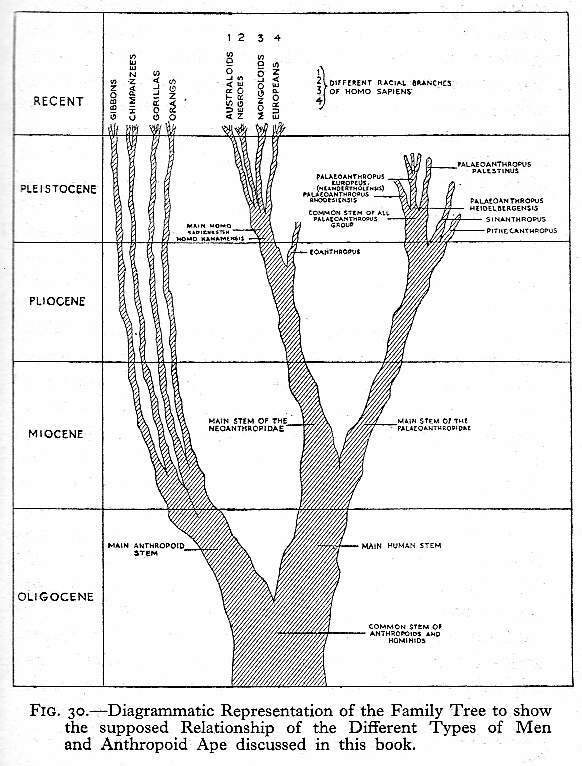 An ontogeny of human ontology? An evolutionary epistemology? Whatever it is, go read Brian Switek’s massive blog treatise Homo sapiens: The Evolution of What We Think About Who We Are at Laelaps. Is this the most irresponsible reporting by a science journalist this year? Surprising fossils dug up in Africa are creating messy kinks in the iconic straight line of human evolution with its knuckle-dragging ape and briefcase-carrying man. Sadly, probably not, but it’s pretty dang awful. Predictably, the creationists are breaking out the champagne flutes. A quick glance at the abstract of the new Nature paper by Spoor et al. 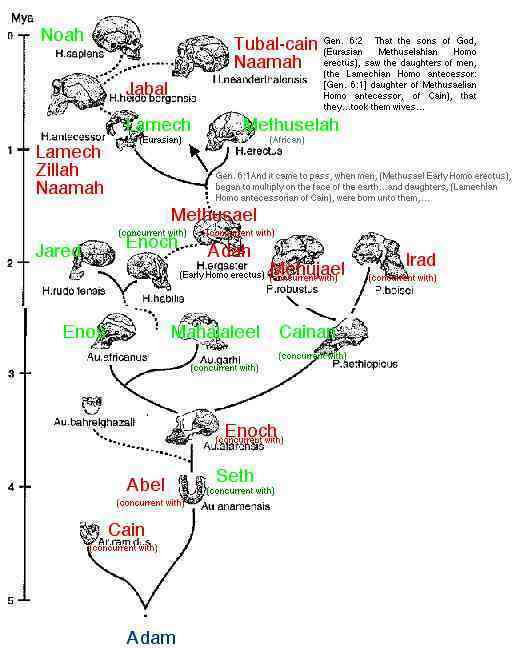 shows that the researchers are hardly calling evolution into question. What Seth means, of course, is that the new research is calling into question widely held misconceptions about human evolution as an evenly-graded straight-line trajectory from Lucy to you. 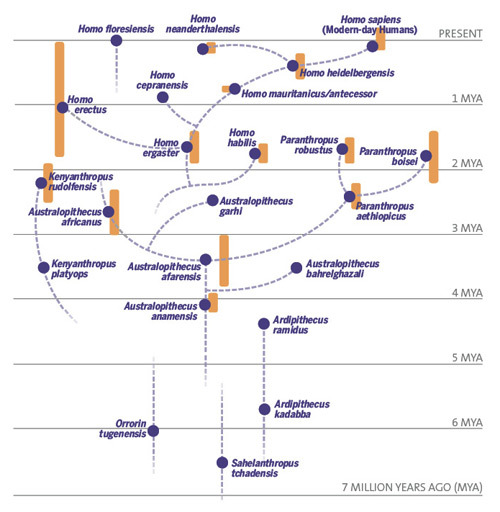 While scientists had largely given up this simplistic model years ago there has remained vibrant debate about the specific temporal, geographic and evolutionary relationships between three early hominins, H. erectus, H. habilis and H. ergaster. Unfortunately, it’s hard (but not impossible!) 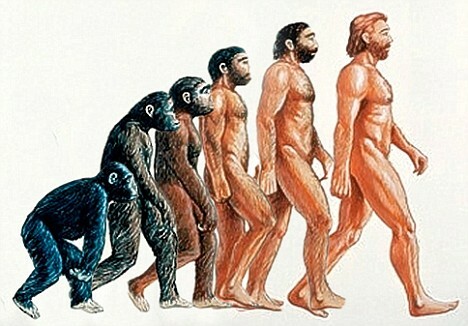 to draw a picture of this, and Rudy Zallinger’s infamous ‘March of Progress’ painting is so deeply ingrained in our collective consciousness that given the task of pictorializing human evolution, most people would no doubt ape some version of it. Like chimps and apes, “they’d just avoid each other, they don’t feel comfortable in each other’s company,” he said. Um, maybe Mr. Borenstein should stick to writing about climate. Um, we don’t exchange in ad hominins around here, anymore, for now. Okay, two cranky posts in a row, something more fun next, I promise! POSTSCRIPT: Seth Borenstein sent me a link to an updated, and substantially improved version of the story: http://www.wtop.com/?nid=220&sid=1212984 I’m still bummed that the original version went to press. I also probably won’t be landing any science writing jobs at the AP anytime soon. Scene–Conversazione of the Therebihangeatailogical Society. Yet another gem from the Wellcome collection. This cartoon appeared in Punch just over a decade after the Origin was published, and only a couple of years after Darwin’s second most influential book, The Descent of Man. 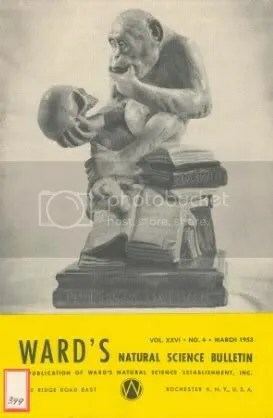 More than a century later, and the arguments are pretty much the same, as Brian lays out in in recent post on creationist responses to hominid fossils. 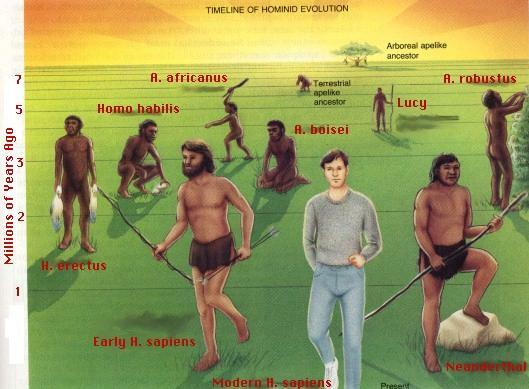 Of course, our understanding of human evolution has progressed a great deal since Darwin, but fossil and genetic evidence continue to provide solid support for his general thesis that mankind evolved from ape ancestors sometime in the geologically recent past. Likewise, creationists, IDers and the like continue to rely on a range of rhetorical strategies, from absurdity, non sequitur and obfuscation to out right lying. Oh yeah and don’t forget ad hominid tactics! Ichthyosaurus painting by Henry de la Beche.